UPDATE (8.50) :The owner of Perpetual Treasuries Limited Arjun Aloysius and CEO Kasun Palisena who were arrested by the Criminal Investigations Department (CID) earlier this morning, were taken to CID headquarters to record their statements , said Police Spokesman. They were arrested by CID officers who arrived at their respective residences in Colombo, today. On Friday, the Colombo Fort Magistrate’s Court named former Central Bank Governor Arjuna Mahendran, his son-in-law Arjun Aloysius and Perpetual Treasuries CEO Kasun Palisena as suspects in the CID’s investigation into the bond scam. The Magistrate also ordered former CBSL Governor Arjuna Mahendran to appear before the CID and give a statement in connection to the investigation, before February 15. The Magistrate also issued an interim order preventing movable and immovable properties of Perpetual Treasuries Limited from being transferred to a third party. Additional Solicitor General YasanthaKodagoda, appearing on behalf of the Attorney General, presented the report of the Presidential Commission of Inquiry appointed to investigate the Central Bank bond scam to the court. 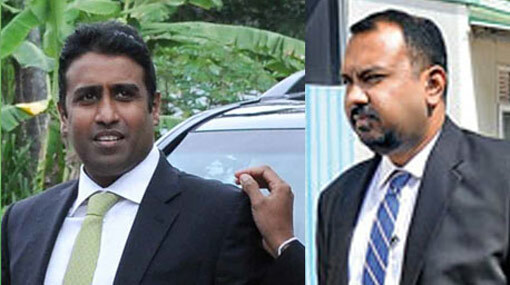 The owner of Perpetual Treasuries Limited Arjun Aloysius and CEO Kasun Palisena who were arrested by the Criminal Investigations Department (CID) earlier this morning, were remanded till February 5, by the Fort Magistrate’s Court.